As mentioned in the piece about Ambelófasoula this is a lovely, light dish. It’s very good for a quick lunch or supper. First of all coarsely grate the courgettes,sprinkle with a little salt and leave them in a colander to drain. After a while – 5-10 minutes – take the grated courgette a handful at a time, and squeeze out as much water as you can. Put it to one side. Now add the grated, squeezed courgette, and add to the frying pan with the onion. Continue to fry, until it is almost cooked. In a bowl beat the eggs with a little salt and ground pepper, and a little crumbled dried mint. 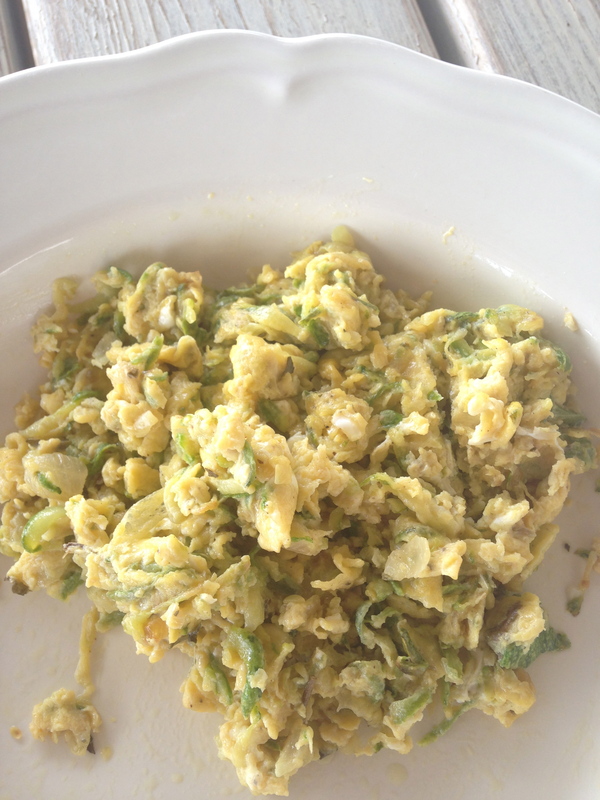 Add the beaten eggs to the courgette and onion mixture and continue to cook, stirring all the time.